At the weekend Marcel Nguyen showed us what he's made of during the DTB Cup in Stuttgart. A portrait of the German gymnast. Marcel Van Minh Phuc Long Nguyen – sounds exotic, even though the 28-year-old was born and raised in the rather more down to earth Bavarian capital of Munich. The son of a Vietnamese father and a German mother, he took up gymnastics at the age of four. His talent was quickly recognized and the boy was nurtured in a gymnastics club. 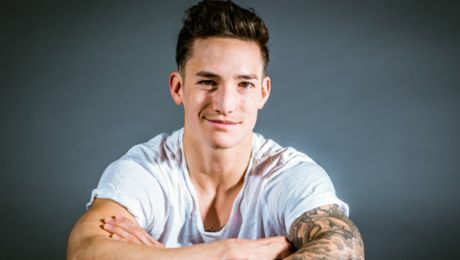 At the age of seven he made the leap to the intensive training centre, then two years later was included in the perspective squad, the circle of the best young gymnasts in Germany. Since then, the Porsche Brand Ambassador has been German champion seventeen times. He won two silvers at the 2012 Olympic Games in London – creating a small sensation. After that, Stern magazine named him the "Silver Posterboy". Loox sport magazine spoke of a "new star in the gymnastics sky". Quite a lot of attention for Nguyen who often comes across as shy. He's now used to it. Also to the laundry baskets full of post – particularly from Asia, where Nguyen has a large fan base. "There are always some really cool things among the post that make me laugh," said Nguyen to the Stuttgarter Zeitung. "A real athlete – just like me"
Stuttgart is now his second home. The 1.62 meter gymnast has been training here at the Olympic Training Centre since 2007. Nguyen is known as an all-rounder – he took part in the combined competition at the DTB Cup and is particularly strong on the rings, the floor and the parallel bars. Here he masters the difficult "Tsukahara" dismount like no other. It was just something he tried out in training one day. Within a week, he'd got the gymnastics move right. When he trains, he goes for it with his whole body. Not for nothing does he have "Pain is Temporary Pride is Forever" tattooed on his chest. He is proud of his car by the way: a Porsche Cayman GT4. "A real athlete – just like me," says Nguyen. For Nguyen the athlete, after the DTB Cup the preparations for the Olympics start in earnest. Let's see if the Silver Posterboy turns into a golden one. 1987 Marcel Nguyen was born September 08, 1987 in Munich. At the age of four he began with apparatus gymnastics and joined the TSV Unterhaching. Since 1995 he practiced at the training center in Munich. 1997 He became a member of the perspective squad, the group of top young gymnasts over Germany. 2002 He had his first participation in an international competition with the youth team. 2006 For optimum combination of training and upcoming Abitur he turned back to the training centre in Munich. 2007 After graduating from high school he won the bronze medal with the team at the World Championships and on floor at the World Cup in Tokyo. 2008 First participation in the Olympic Games. Marcel reached the 4th place with the team. 2009 Marcel finished second in the Champions Trophy and the German Championship 2nd place. This was followed by winning the title in the German National league with KTV Straubenhardt. 2010 The first time a German team won the European title. He was a member of that team and also won the bronze medal (floor). 2011 Gold on the parallel bars at the European Championships in Berlin. The last time a German gymnast had won was in 1955. 2012 Marcel defended his title as "European champion on parallel bars" and was nominated for the Olympics. In London he presented himself once again in great shape and won not only the silver medal on his parade discipline, but also in the supreme discipline, the all-around. In August Marcel was honored by the German magazine "SPORTBILD" as "Newcomer of the Year" and was awarded with the "silver bay leaf" by the German President Joachim Gauck. In addition he won third place at the elections "Sportsman of the Year" (elected by German sports journalists). In November / December Marcel won the EnBW Gymnastics World Cup in Stuttgart and at the World Cup in Glasgow. 2013 Overall victory in the all-around World Cup series. Marcel also won gold on parallel bars and rings at the German Championships. An interview with Porsche Brand Ambassador Marcel Nguyen. The Porsche 919 Hybrid has achieved the eighth pole position at the WEC. Every year, the he world’s best female tennis players meet in the Porsche-Arena. The Newsroom takes a look behind the scenes.